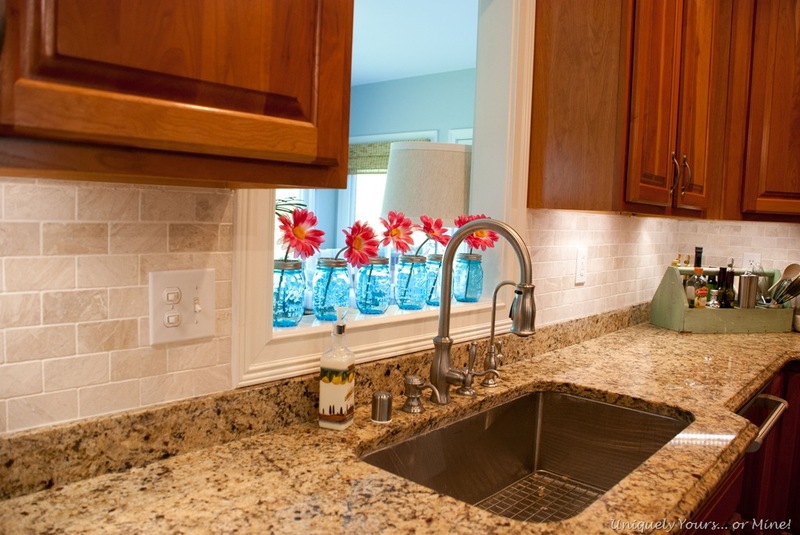 Our DIY Kitchen Remodel – Uniquely Yours… or Mine! 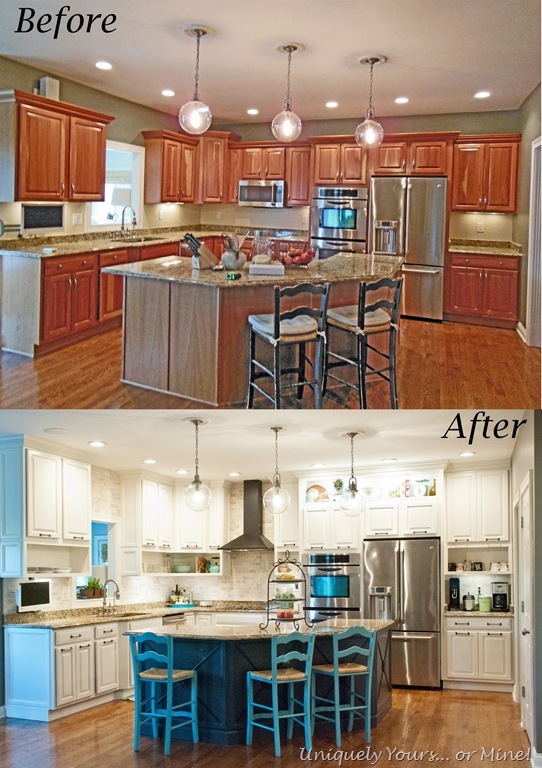 I’m so excited to be able to not only finally share our kitchen remodel with you, but to also just be D-O-N-E!! 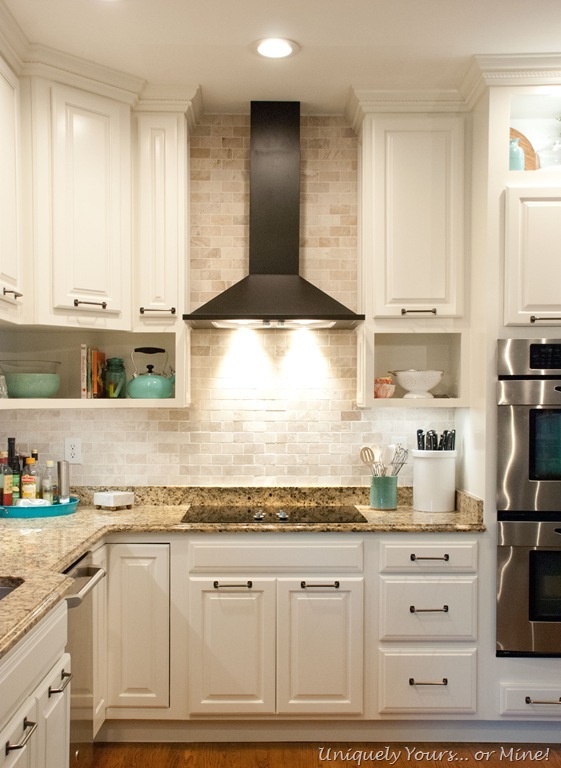 I I think that the progression from concept to completion went very smoothly with only a few tweaks (tile and range hood) in the overall original design. 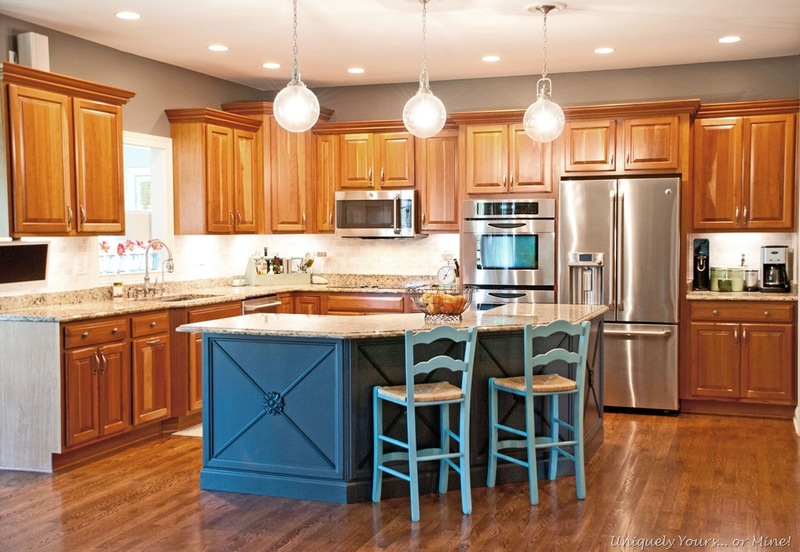 I’m also very sure that I will want my cabinets in any future home setup like this, with open cabinetry below closed cabinetry, it just works so well for all of us and no extra dusting required! So here is where we started (that’s the home inspector at the island), my hubby took photos of the house as he was inspecting it. 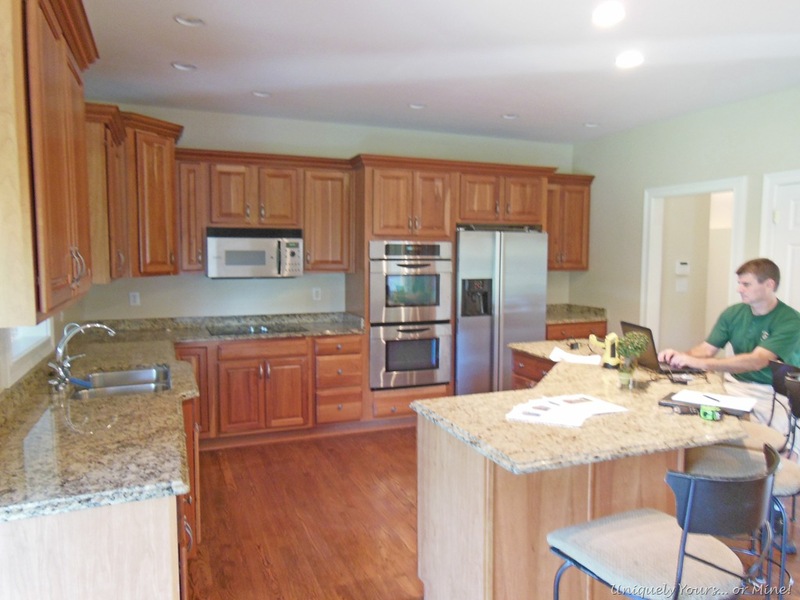 What we have is a nice, open, good sized kitchen just not exactly what we wanted. 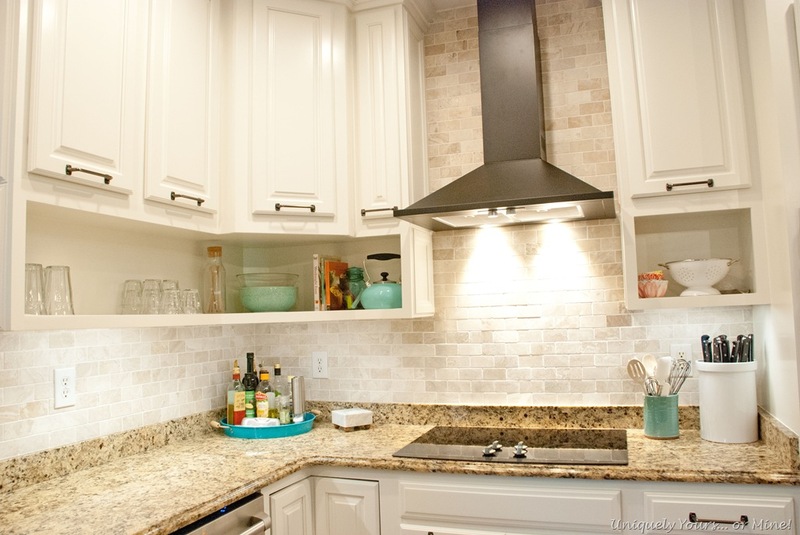 The first stage for us was replacing the can lights for pendant lights, new fridge, microwave, sink, faucet, dishwasher and updating and painting the island. The third stage was to update and paint the butlers pantry, it was also my “test” for the kitchen cabinet paint color (Benjamin Moore White Dove). Then FINALLY the last stage, raising the original cabinets to the ceiling, making new open cabinets to install below, adding decorative molding, installing more tile above stove and sink window, installing new range hood and adding a decorative cabinet above stove and fridge and painting all of the cabinets and installing new hardware… WHEW that was a mouthful and I’m pretty sure a run-on sentence!! I hand painted (with a combination of foam roller and soft bristle brush) with Benjamin Moore’s Advance paint line all of the cabinet boxes and trim, but I spray painted the doors in the garage. I always follow the same routine, clean the cabinets with Formula 409, fill imperfections, lightly sand, wipe down with tack cloth, spray prime, sand, clean, spray paint color and repeat as many times as necessary. I sprayed 4 coats on each door side, letting them sit for 24 in between each coat and a week before I flipped them from the back to the front (always paint the back first). The final finish looks great! The molding I added is the same we added to the island and helps disguise where the 2 cabinets are connected. So much easier to access glassware and everyday dishes now! We love our new hood, it works so much better than the microwave vent and because it is mounted much higher than the microwave was it helps open that space up. 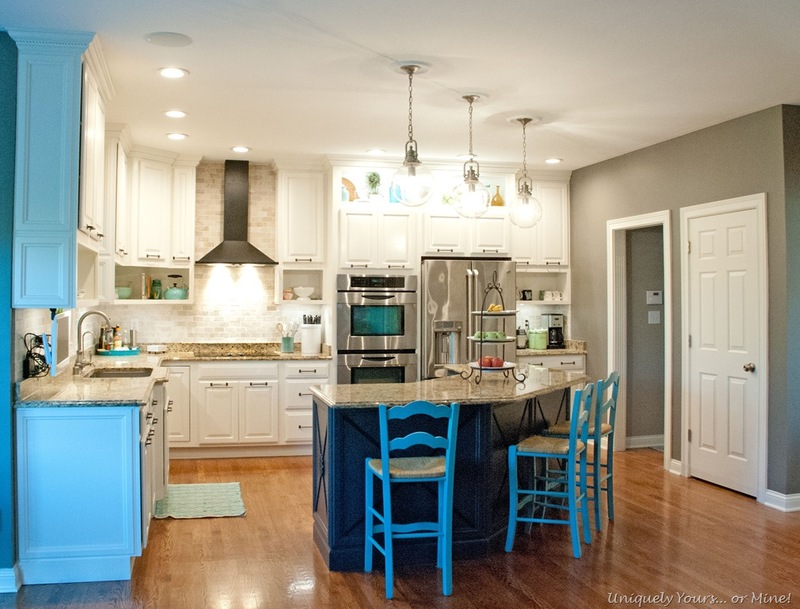 The wall color in the kitchen is Benjamin Moore Chelsea Grey. Well that’s it! No more phases left to do, whew!!! 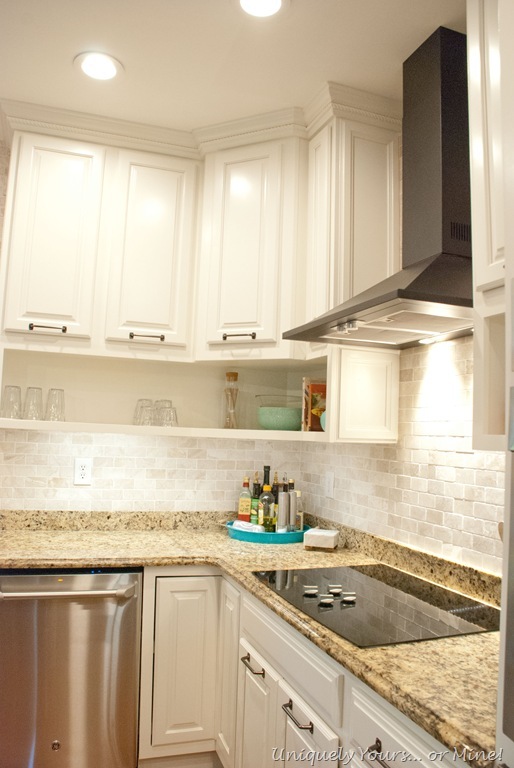 Thanks so much for stopping by, I hope you enjoyed this walk-thru of our kitchen renovation! This looks awesome! Please share where you put the microwave. 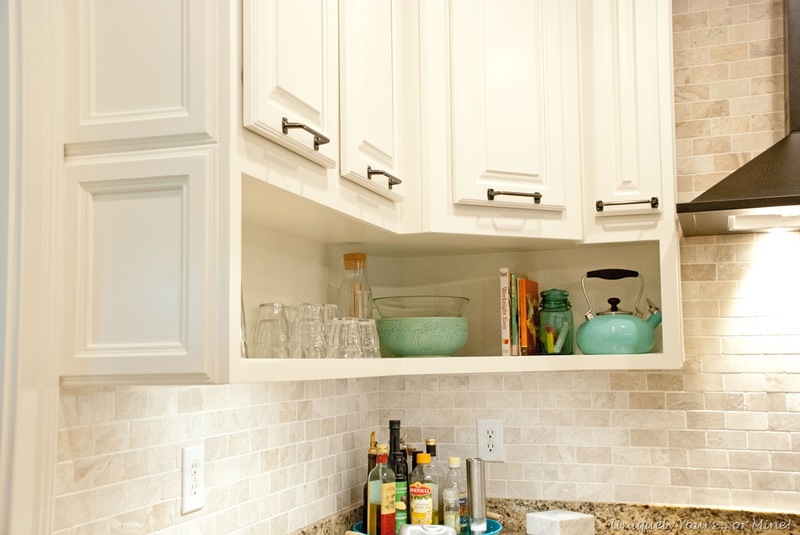 I am seriously considering raising our cabinets as well and love the shelf underneath. Also would like to move the micro somewhere, possibly a shelf. So the standalone hood would work in our kitchen as well. Thanks Shelly! Right now the microwave is on the counter in the butler pantry area, which actually works well for us, but we installed an outlet in the corner of the large open cabinet for the microwave to go there. Our current microwave is an inexpensive one we had in the basement kitchenette, it will fit in the open cabinet, but I’m looking for a better one to purchase before I move it to the kitchen… If I move it to the kitchen at all. 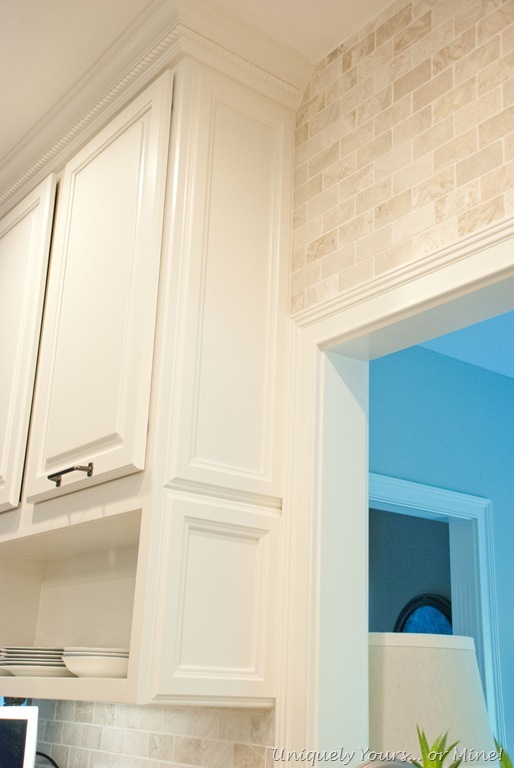 I struggled with placement options, my favorite option was in the pantry as we had installed one there in the first house we built and we loved it, but we’d need to hire an electrician to get power to the area so we will see… Hope you find a perfect place for yours! As far as paint goes, absolutely I would use BM Advance again, the only other paint I would consider is Cabinet Coat. I “heard” Cabinet Coat was going to be purchased by BM which would make coloring the product much easier. Both products are very durable but CC does dry faster and has a shorter cure time, but it has to be color matched. 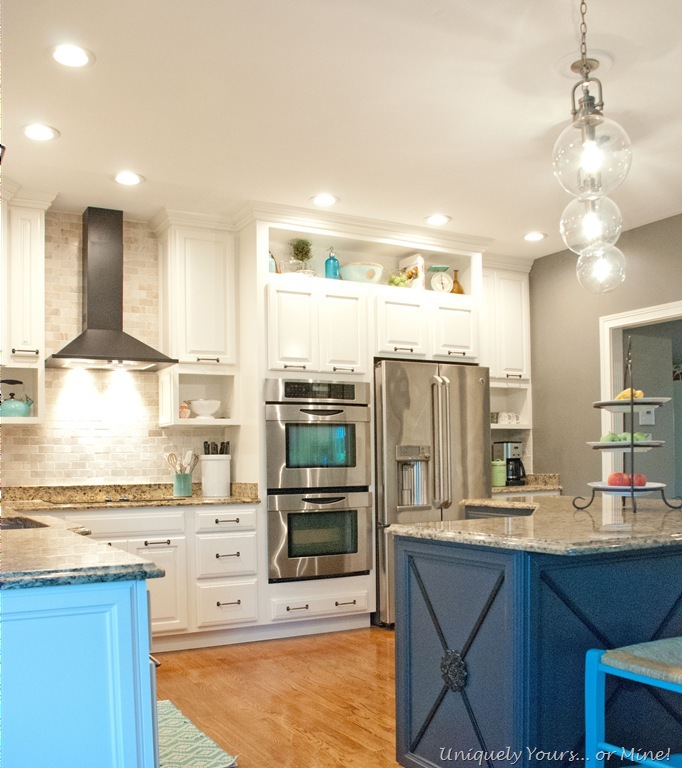 I painted our last kitchen with CC, but I have used Advance in this kitchen and the master bathroom and I will say the product holds up extremely well. Hope this helps you in your decision making process, let me know if you have any other questions! 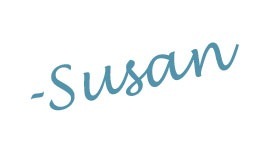 Susan,your kitchen is really,really beautiful. 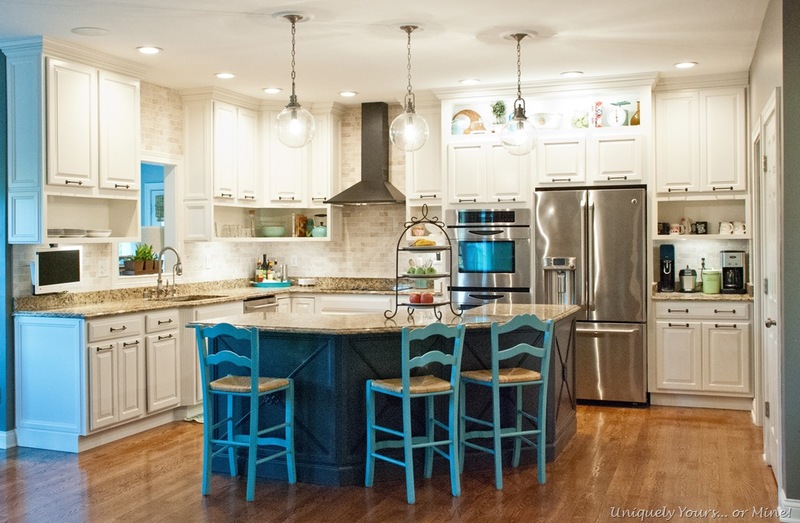 Been reading since you painted the island blue.there are many features I like,but the tiled wall over the cooktop and sink is my favorite. Thanks so much Sue! It’s funny you should like those 2 parts the best as they were kind of last minute design changes that I wanted to do but my hubby didn’t want too! As you can see who won that disagreement, but mainly because I was able to get him to admit that he didn’t want to do the extra work not that the design idea wasn’t good…. We both agree now that it was the right call and I love both of those areas too! 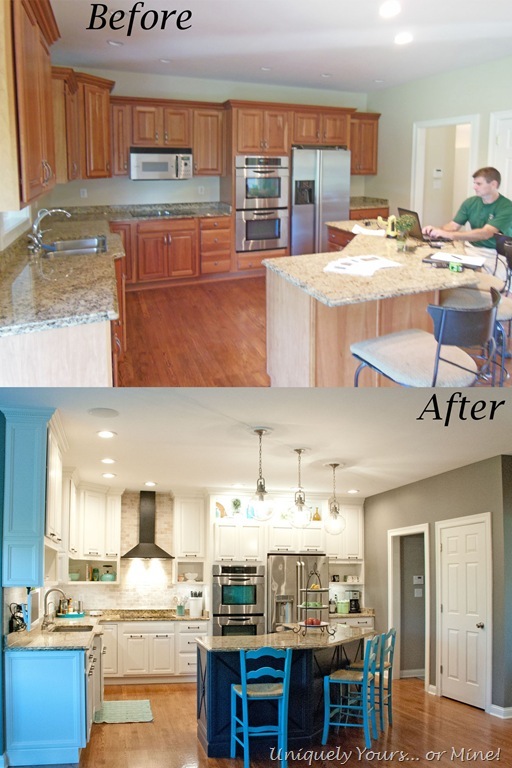 Incredible kitchen re-make! You said you spray-painted the cabinet doors in the garage, but how did you paint the main body of the cabinets? 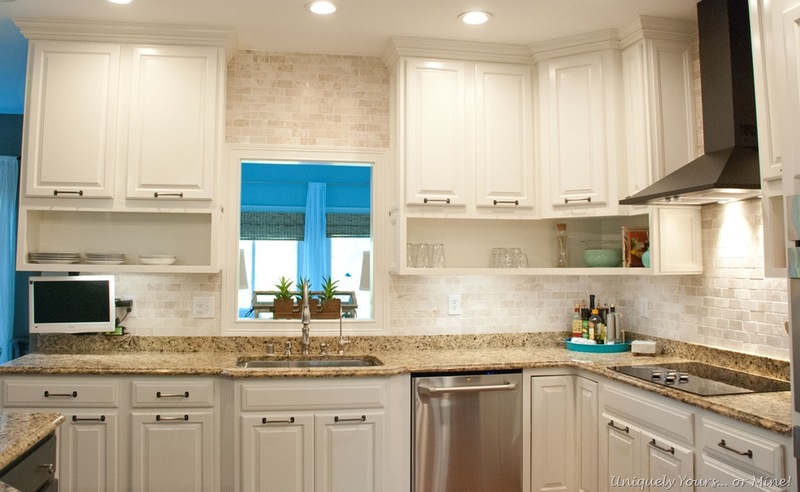 Would the paint you used work on metal kitchen cabinets? I think you outdid yourself with this one, and kudos to your very talented husband, too! Thanks so much CJ! I painted the body of the cabinets with a combination of a very soft bristle Purdy brush and a foam roller whenever possible. As far as painting metal cabinets I’m not sure, I would ask them at BM, they’re fabulous help, just be sure to clean them well and use a high quality primer made for metal priming as well… Your final product will only be as good as the work you put into the prepping stage. I love it. It is so much more open and airy and brighter now. 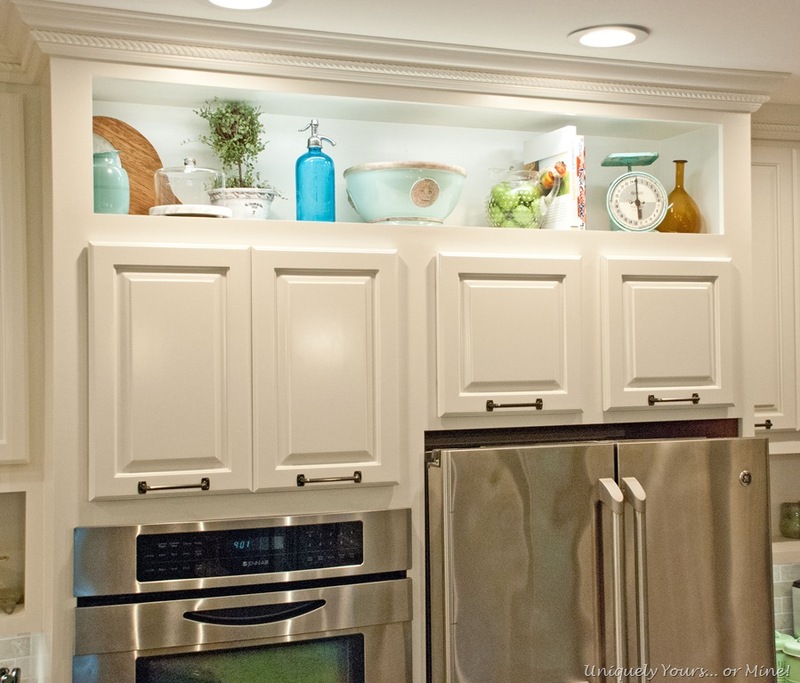 I am planning on moving my cabinets up flush with ceiling and painting them a lighter color than the dark walnut / oak look they are now. This has been so inspiring. I started following you over a year ago when I saw some furniture upgrades. Thank you Mrs. Susan and keep up the good hard work. 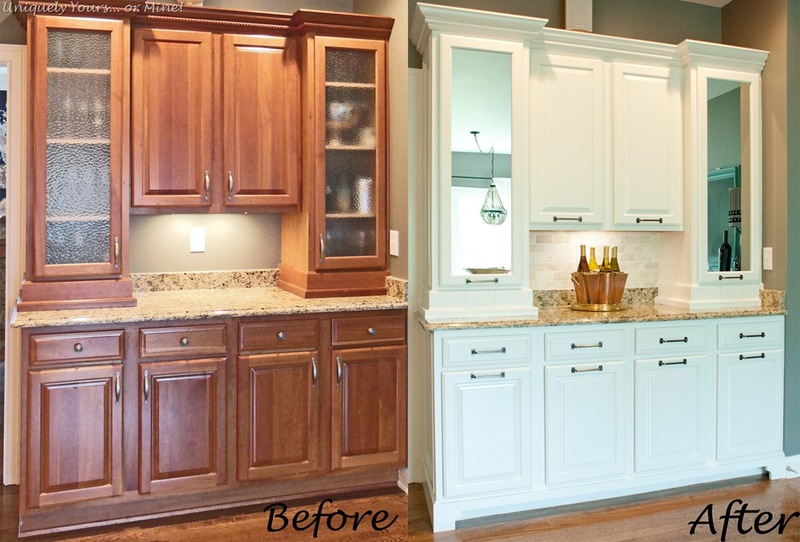 Thanks so much Janet, I’m so glad you love the cabinet makeover! I hope you love yours once you move them up, it really makes the ceilings feel so much higher… It’s crazy! Holy smokes Susan! It is AMAZING!!!!!!!!! You’ve got to feel so proud, happy, relieved! Such an incredible job. Congrats!! Thanks so much Andi! I’m certainly thrilled with how it turned out and especially how it functions! Pingback: It’s official, we’re moving! | Uniquely Yours... or Mine!